Portugal's cuisine blends 800 years of tradition with cutting edge flair. Portugal's restaurants and bars are no longer playing second fiddle to neighboring Mediterranean countries. Like any major European culture, Portugal's cuisine is a balance between centuries-old traditions and modern, international influence. In Portugal, you can find traditional tabernas and tascas, which put a heavy emphasis on locally-caught seafood. And a recent recession has helped revive affordable, appetizer-sized pesticos. Depending on where you are in the country, you will discover unique, regional recipes—like the dark, rich broa bread of the north. Broa is made from cornmeal and either wheat or rye flour. And in the northeast, visitors will discover restaurants specializing in smoked hams (known as presunto), and handmade sausages. Central Portugal, between Lisbon and Porto, is best known for heaping platters of octopus, rice, and chanfana: goat meat stewed with wine. Breads, sausages, and dark hams grace the tables of the southern Alentejo region, while spicy grilled seafoods are most popular along the Algarve coast. While the entire country produces outstanding artisan cheeses, travelers should go out of their way for the rich sheep's cheese known as Queijo da Serra, from the Estrala Mountains. A customary crowd pleaser in Madeira is milho frito: fried cubes of polenta served alongside skewers of local beef or fish. And in the Azores, lapas (a shellfish), and croques (small mollusks unique to this volcanic archipelago) are the thing to order, while chili peppers and paprika are the spices of choice, often atop a sizzling cut of beef that has been grilled or roasted in a wine sauce. No matter where you are in Portugal, this definitiive guide will help you decide exactly what to eat—and where to get it. 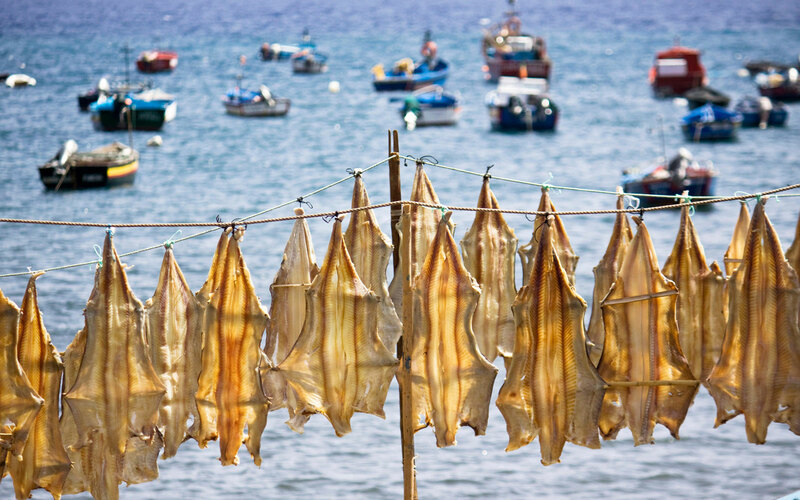 Historically, one of the staples of Portuguese meals is bacalhau, a dried, salted cod eaten across the country. In fact, the Portuguese say there are 365 different ways to make cod—one for each day of the year. Consequently, bacalhau preparation varies wildly across the country. In Lisbon, be sure to stop at Laurentina Restaurant, arguably the best spot in the capital for traditional bacalhau. Get sliced cod roasted over hot coals, or baked with oil and black-eyed peas. Perched atop the Miradoura de Santa Catarina—a hillside lookout that overlooks the city and river below—is Noobai Cafe, where a Moroccan-meets-Asia-meets Mediterranean menu pairs perfectly with gorgeous sunset views from the open air terrace. We recommend the chicken salad with red curry and mango (and a pitcher of white sangria infused with basil and pomegranate). With seafood being the Portugal's main calling, it's not a surprise to find ceviche on many menus across the country. But when it comes to buzzworthy ceviche in Lisbon, the can't miss restaurant is A Cevicheria. Located in the Principal Real neighborhood, Chef Kiko Martins is reimagining the popular Peruvian delicacy with a Portuguese twist. Inside the white-washed restaurant, with its blue-patterned floor and prints of painted cranes, guests will find Ceviche Portugues, made with codfish, an aromatic rosemary vinegar, chickpea puree, dried olives, and corn bread with sausage. A tasting menu of six entrees is available for 35 euros as well. Tiny Nova Pombalina is a popular Lisbon restaurant always packed at lunch time. Here, locals stop in for quick leitao (suckling pig sandwiches) prepared in 60 seconds or less on fresh-baked Portuguese bread with an amazing—and totally secret—vinegar sauce. The crew behind the counter is comprised of old school Lisboans, who are quick to crack a joke and even quicker to toss a hot-and-crusty sandwich your way. Pair with a pint of local beer on tap, or a fresh-squeezed juice. If you simply cannot decide where to go and what to eat in Lisbon, rest assured: you don't have to. 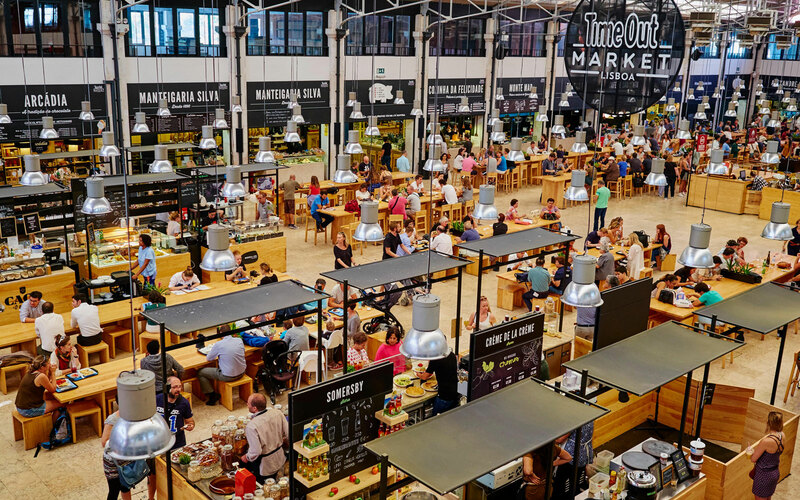 Take a trip over to the TimeOut Market Lisboa, in the Cais do Sodre neighborhood, a gourmet food hall concept opened in 2014. Twenty-four restaurants, eight bars, a dozen shops, and a high-end music venue all come together under one roof to showcase the very best of Lisbon, including (you can find everything from steak and burgers to sushi and traditional seafood). Best of all, it's very convenient for visitors who want to sample a bit of everything. Up the coast, in Cascais, you'll discover a sleepy coastal community serving some of Portugal's best seafood. If you're going to eat Portugal's daughter dish, you should—whenever possible—do so with ocean views. Our favorite is Bar do Guincho, a beachside joing with particularly on-point seafood and a laid-back, palapa vibe. Not to miss here is the Octopus a Lagareiro. 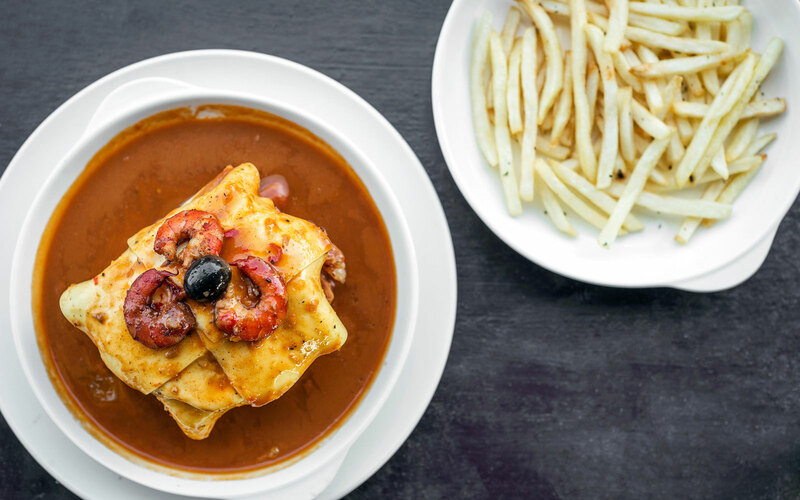 Porto may be best-known for its eponymous wine, but a visit here is incomplete without sampling a Francesinha sandwich. This local treat is far from low cal (you may want to skip dinner afteward), but it's kind of a must-order dish. Francesinha sandwiches are made with Portuguese bread, ham, fresh sausage, steak or roast meat, slathered with melted cheese, and doused with a sauce made from tomato and beer. The whole concoction is served with a mess of french fries. For the best in Porto (and arguably the country) visit Porta'O Lado. Want to get a little more hands-on? Consider a cooking class with Cooking Lisbon. The local tour operator is known for its organized cooking and baking classes, Take a two-hour course in Pastéis de Nata, or the almond cream-filled puff pastry travesseiros. Another company to consider is Taste of Lisboa, which takes foodies through the lesser known areas of the city like Campo de Ourique, which is where the ride on Tram 28 ends. You'll explore new food markets, visit a restaurant specializing slow-cooked pork, and sample the so-called best chocolate cake in the world.